The University of Reading has a long history of excellence in medieval studies, reaching back to the early twentieth century when Sir Frank Stenton, author of Anglo-Saxon England (Oxford, 1943), was its first professor of Medieval History (1926-46) and subsequently vice-chancellor (1946-1950). 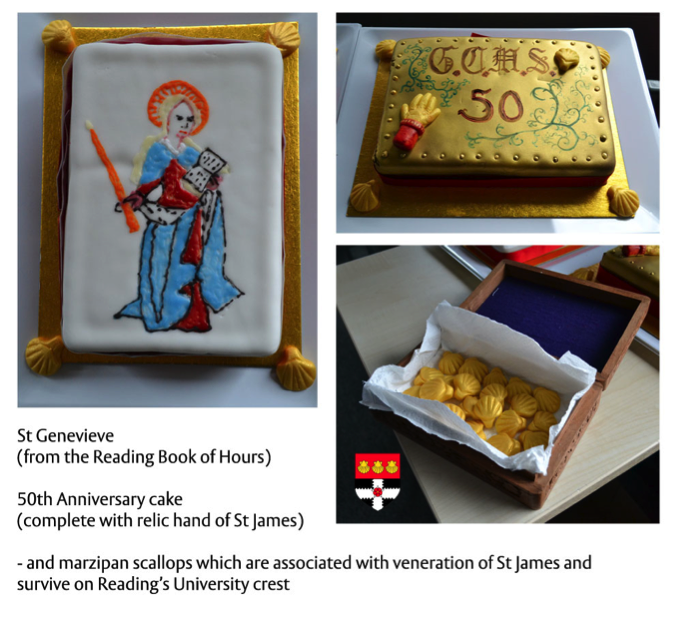 The Graduate Centre for Medieval Studies (GCMS) was established in 1965 and since then, a great deal of research has been carried out by members. The GCMS publishes an interdisciplinary journal, Reading Medieval Studies, occasional monographs, and the postgraduate and early career journal, The Reading Medievalist. In addition to its postgraduate teaching, it also runs an annual programme of visiting speakers concluding with a symposium in the summer. This year’s symposium is the highlight of the anniversary celebrations and was launched by the inimitable Anne Lawrence, current director of the GCMS. 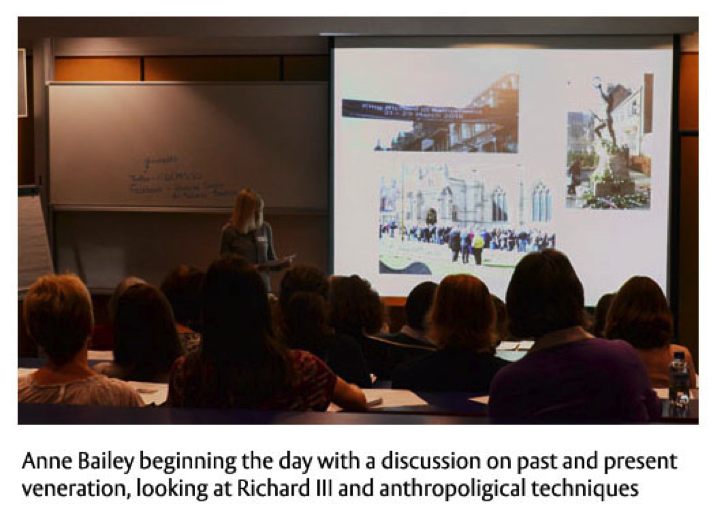 The first speaker was Anne Bailey (Exeter) who discussed the role of anthropology in relation to the study of history, and what can be learnt from its methodologies, in her paper “Anthropology, the Medievalist…and Richard III”. Anne analysed what an anthropological view of the public’s response to the recent Richard III events could tell us about today, and also about the past. The ‘veneration’ that was shown to Richard certainly draws parallels with medieval veneration: Philippa Langley’s faith that he would be found; the miracle of his discovery; and even the tourist attraction of the location in which he was found where visitors may “sit and reflect”. There is a thin line between commemorating dead celebrities and venerating medieval saints, and Anne used the examples of Graceland and Lenin’s tomb to illustrate this point. Her talk concluded by reminding us that Richard III is not a saint. However, by applying a modern anthropological approach, we might further understand veneration/devotion in the past. Anne’s paper was followed by Carolina Escobar-Vargas (Antioquia), all the way from Colombia, speaking on “Magic, Technology and New Categories of Knowledge in the central Middle Ages”. Carolina took us all the way back to post-Roman Britain and the journey of Merlin to Ireland. 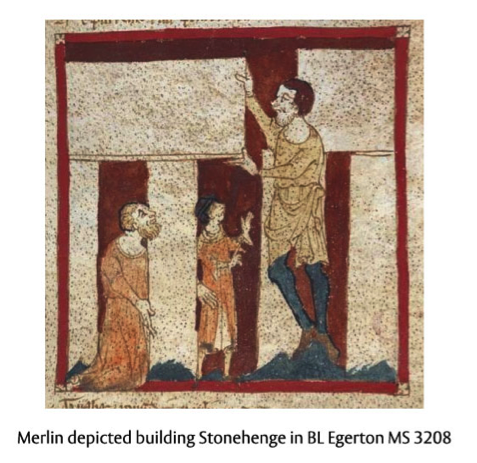 Amongst other ‘miracles’, Merlin was even credited with building Stonehenge, and Carolina’s paper focussed on the perception of magic. How was it accessed, and could it be accessed as a Christian without the use of demons? She guided us through the discussions of many great thinkers and writers at the time, showing us how they justified Merlin’s use of magic as something that he had acquired through study and intellect. It was through these that supernatural powers could be accessed without demonic intervention, and Merlin was presented as a user of “natural magic” who accessed the occult through knowledge and skill. After a short break, we reconvened for a paper by Karen Pratt (KCL) on “Adapting the Romance of the Rose for a Multi-text Codex: the case of Poitiers MS 215”. This was a fascinating paper that looked at what can be learnt through analysing how a text was abbreviated and re-used. The particular manuscript she was examining was probably produced by an older editor for a young student, and by examining the creative decisions made regarding what passages to include and to exclude, a picture of the type of advice that was being given to this young noble emerged. The advice was wide ranging, from the distrustfulness of lawyers and judges, to the dangers of women! 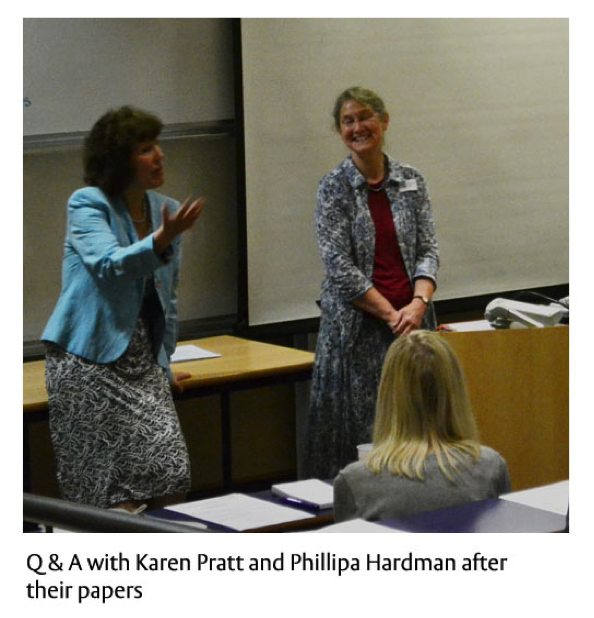 Karen was followed by Phillipa Hardman (Reading), speaking on “Wine woman and song, innovation in the middle English Charlemagne romances”. She artfully demonstrated the degree of variation in the telling of the same story between regions, with these variations demonstrating the flexibility of authors regarding their audiences. After lunch, we dove into the topic of the moment, Magna Carta, with Elizabeth Matthew (Reading) “On the road to Magna Carta: King John, William Marshal, and the Barons of Ireland”. She led us through John’s activities in Ireland which began inauspiciously in 1185 when, on his first visit, he pulled the beards of the Irish chieftains. The examination of his relations with the nobles in Ireland proved to be a precursor to the baronial revolt in England, and tells us even more about just what kind of king John was. The final paper of the day was by Brian Kemp (Reading) on “King John and Reading Abbey”. He began by re-acquainting us with the history of the abbey founded as a mausoleum for Henry I and his family, before detailing King John’s surprisingly close relations with the abbey. John granted gifts in compensation for the removal of the reliquary of the abbey’s important relic, the hand of St James, by his brother Richard to pay for the crusades. John also made frequent visits to the abbey in times of crisis, including in the lead-up to the sealing of Magna Carta. The basis of the paper was evidence from the Reading annals, the publication of which is keenly anticipated. 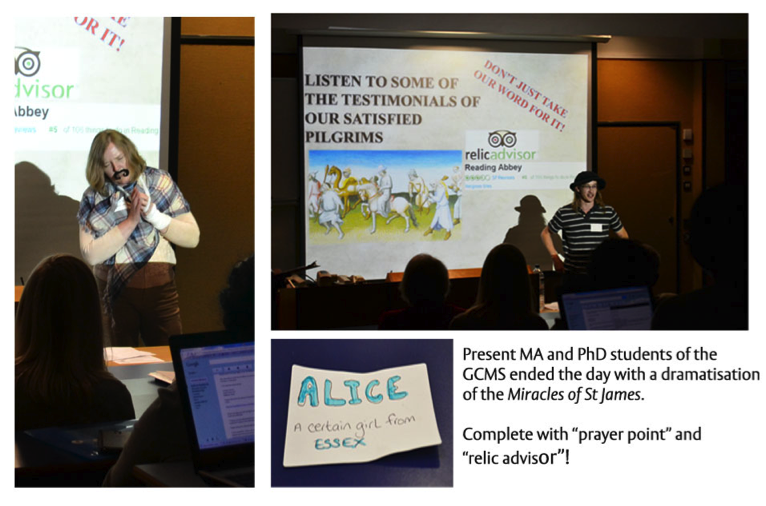 The day was finished by a presentation from the present students of GCMS who presented the miracle stories of the Hand of St James within the playful context of an abbot seeking to find new ways to increase revenues. Cake and Pimms followed this, and marked the end of our 50th anniversary celebrations. This entry was posted in Medieval History, Students Page. Bookmark the permalink.